A Message from Father John Corapi. We find ourselves caught in a violent spiritual war today. We need all of the help we can get. One of the greatest aids God has given us is the gift of His own Mother. We are foolhardy indeed if we refuse or fail to avail ourselves of this powerful gift. 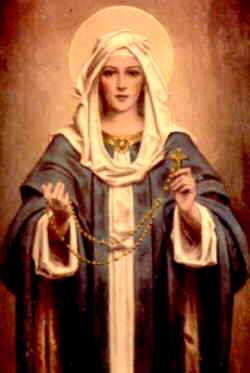 Pray the Rosary every day. If we do not do this I’m afraid we’ll bear much of the responsibility for the state of the world—which is catastrophic. Can God bless a country that formally and legally embraces such human rights abuses as the genocide of abortion? Can God look fondly on a world that sanctions things such as fetal stem cell research, human cloning, and gay marriage? These things constitute an assault on life itself, yet the average person is apparently too dull witted or morally blind to see this. At decisive times in human history, when all seemed dark, desperate, and nearly lost, the Church turned to Mary, the Mother of the Lord and our Mother, the Woman Clothed with the Sun. She interceded for poor humanity with her Son and won the day. We are at such crossroads now and this May let’s not fail to turn to her in all of our needs. Everything we give to her, all of our prayers, go immediately to Jesus, Who gives them to the Father in the power of the Holy Spirit. I strongly urge you to totally consecrate yourself to Jesus through Mary, pray the Rosary every day, and have confidence in her maternal intercession. Above all love your Mother, for I promise you—your Mother loves you.